“You need to do hard things to be happy in life. The things most people avoid, such as those that make you uncomfortable, that are far easier to hide from, that others can’t do for you, that make you second-guess yourself and question how you’re going to find the strength to push forward. “I absolutely adore the opening lines of your book. Although they’re merely the icebreaker to the depth of knowledge and narrative that follows them, these lines by themselves speak volumes to me. Because the hard things I know I need to do for myself are always the easiest to avoid on a daily basis. It’s undeniably crazy how often I catch myself sidestepping the very tasks that would make me happier and more fulfilled in the long run. Honestly, I couldn’t resonate more with this reader’s sentiment. The hard things are always the easiest things to avoid, for all of us. We distract ourselves. We procrastinate. We make excuses. We pretend like the hard things that need to get done somehow don’t apply to us and our present life situations. But, of course, that’s not reality. And reality always rears its head in the end. The real truth about how ordinary people — like you and me — achieve extraordinary happiness and incredible feats of success in their lifetime is that they step out of their comfort zones on a daily basis and do the hard things that their more privileged, talented and qualified peers don’t have the focus, drive or determination to do. So, let’s make a stand right here, right now, together. Let’s start doing the hard things TODAY! And as we gradually notice our progress stacking up, I guarantee we will be blown away at just how remarkable we really are and just how rewarding life can be. As our reader mentioned, the key is keeping our minds focused on what needs to be done. Practice pausing every day, as often as necessary, to reflect on this. Write yourself some “notes to self” — like the ones listed below (all of which are excerpts from our NYT bestselling book) — and then place them where you can easily see and reference them throughout the day (for example, my notes are taped on the wall directly in front of my desk, and then I have one set as the background on my iPhone). These “notes to self” will help keep you on track by keeping your mind empowered with trains of thought that push you to do the hard things you know you need to do on a daily basis, to be happier and more fulfilled in the long run. Note to Self: You need to choose yourself today. – You won’t always be a priority to others, and that’s why you need to be a priority to yourself. Learn to respect yourself, take care of yourself, and become your own support system. Your needs matter. Start meeting them. Make YOUR priorities a top priority. Don’t wait on others to choose you. Choose yourself, today! Note to Self: You need to start long before you feel ready. – If you wait until you feel 100% ready, you will be waiting the rest of your life. Realize this! Some people wait all day for 5pm, all week for Friday, all year for the holidays, all their lives for happiness. Don’t be one of them. Note to Self: You need to let your actions speak loud and clear. – A big part of your life is a result of your choices. If you don’t like some part of your life, it’s time to start making changes and new choices. And it’s OK to be low-key about it. You don’t need to put everything on social media. Silently progress and let your actions today speak for themselves. Note to Self: You need to delete the distractions you often engage in. – If it entertains you now but will hurt or bore you someday, it’s just a distraction. Don’t settle. Don’t exchange what you want most for what you kind of want at the moment. Study your habits and rituals. Figure out where your time goes, and delete distractions. It’s time to focus more on what matters. Note to Self: You need to embrace discomfort for the right reasons. – Everything gets a bit uncomfortable when it’s time to change. That’s just a part of the growth process. Things will get better. Be patient and remind yourself: Life never gets easier, you just get stronger. Note to Self: You need to be willing to struggle for progress. – As you struggle, remember, it is far better to be exhausted from lots of effort and learning, than to be tired of doing absolutely nothing. Effort is never wasted, even when it leads to disappointing results. For it always makes you stronger, more educated, and more experienced. Note to Self: You need to deliver results, even when making excuses is easier. – NO shortcuts. NO quick fixes. NO blaming others. NO “I’ll do it tomorrows.” NO MORE EXCUSES! Just get started. Quit talking and begin doing! Laziness may appear attractive, but work leads to progress and long-term fulfillment. Note to Self: You need to embrace where you are, even as you move forward. – Stop beating yourself up. You are a work in progress — which means you get there a little at a time, not all at once. Just embrace where you are! The route you traveled to this point no longer matters, for nothing can be done to change it. What matters is what you do from here, in this moment. Note to Self: You need to love exactly what you are doing, at all times. – There is no progress without love. Being productive is a byproduct of loving what you do. So… love what you do, until you can do what you love. Love where you are, until you can be where you love. Love the people you are with, until you can be with the people you love most. Keep applying this philosophy to all aspects of your life. Note to Self: You need to trust the journey. – Someday you will understand the reasons — that it had to happen, just the way it did… to give you the lessons you needed to grow. It’s never ideal, and it’s rarely easy, but what doesn’t break you today only makes you stronger in the end. Take a deep breath right now, and keep going. Note to Self: You need to focus only on what you can control at the present moment. – The challenge is ultimately to take life day by day and be grateful for the little things. Don’t get caught up in what you can’t control. Accept it and make the best of it. When you stop worrying about what you can’t control, you have more time and energy to change the things you can control. And that changes everything in the long run. Note to Self: You need to keep your expectations of others in check along the way. – Don’t lower your standards, but do remember that removing your expectations of others is the best way to avoid being disappointed by them. You will end up sadly disappointed if you expect people will always do for you as you do for them. Not everyone has the same heart as you. The key is in not being emotionally co-dependent on other people’s behaviors. Don’t let your expectations of others hold you back from being the best you can be. It’s time to think of moments when you are most likely to give in to impulses that keep you stuck and take you farther away from your best intentions. Then use your written “notes to self” as visual reminders to interrupt those negative impulses and keep yourself on track. Which “note to self” — or “hard thing” — mentioned above resonates with you the most today, and why? M & A, I’ve mentioned this to you in the past but I wanted to reiterate it again today: the positive reinforcement and coaching I’ve received from you, both directly and indirectly, over the past several months has been priceless. I was lucky enough to catch your Think Better, Live Better conference in San Diego this past winter and it was the catalyst for lots of positive growth in my life! I appreciate you both in so many ways. As for this post, the underlying theme of not hesitating and procrastinating really spoke to me. I’ve lost some things in my life, and for a long while I used my hard reality as an excuse to give up on just about everything. I kept pushing off the little steps that would help me heal. But the self-questioning rituals you built with me gradually got me moving int he right direction again. The importance of daily rituals cannot be overstated. Every positive change I’ve successfully made happened one day at a time over the course of several months. Thank you, again. So pertinent to everything I’m working towards right now. And so is every single “note” above. Thank you for another enlightening read, Marc & Angel. I always try to remind myself that I have opposable thumbs and fingers and thus the ability to manipulate my own environment; I have the ability and the choice to act and am not required to wait to be acted upon. Marc and Angel, your course and coaching and readings have continued to inspire the right kind of action in my life, and for that I am grateful. And #8 in this post is something I continually remind myself of. If there is one thing that never ceases to amaze me in the years of reading your blog posts, is how often the topics of your writing comes at very appropriate times. They are like gifts in my inbox solidifying and giving me strength to carry out what I need to focus on at that time. If it wasn’t for your ability to live by your own words we collectively couldn’t all be bettered by them. So true! Especially as someone with anxiety which gives me very physical symptoms it’s easy to say “no that stresses me out, I’ll be calmer and happier if I dont do it” but you have to push past the stress to enjoy things! Confidence and happiness I feel have almost a snowball effect, once you start doing some things that make you uncomfortable suddenly you can do so many more! I plan to use these notes to share with my 12 yr old granddaughter who is with us for a few weeks this summer. Her mother left the family for a job in another state and the children are with my son, their father. She says she feels abandoned and won’t talk about it. I hope our talking about these 12 notes can start a dialogue about her feeling and how she can handle them. Thanks! If you have any other suggestions they would be greatly appreciated. Thank you so much. I cannot express this adequately enough to match my appreciation for the things I’ve recieved, from all of the things that you two have shared. I am a success story. And not just any ordinary story either, my story is one of those absolutely extrordinary success stories…. Although by appearance It doesn’t look like it, but that’s only because I haven’t finished yet. Ok, so life beat me down…. So What ? So Life took everything from.me… So What? Thank you so much…. You are a Big Part of My Success…. “Some would say ~ it’s still yet to come” So What??? P. S. Have a Wonderful Week. Such wisdom. I, too, need to do this work and also share it with my son. Have you ever thought of putting together a book or video series for teenagers? Their lives are so confusing and stressful- think how amazing it would be for teens to hear your wisdom and practical advice during these important years! And even if my son won’t listen to me, he might listen to you.😊 Blessings! Today, #12 resonates the most with me. I’ve struggled with codependency for years, in my long time relationship with someone who has an alcohol addiction. It is an almost every day need to remind myself to keep my expectations in check (as you say) and to not be disappointed if things are not happening as I think they should. And to just let it be. The bottom line though, as it should be, is that I’m good with ME. This a great list overall–thank you! THANK YOU! I’m facing a very very hard time in my life. Its have so many moving parts and it has my head spinning, my heart aching and I often feel my self slipping away into depression. Your newsletters and emails remind be to breath….Take that next step. I can do it. 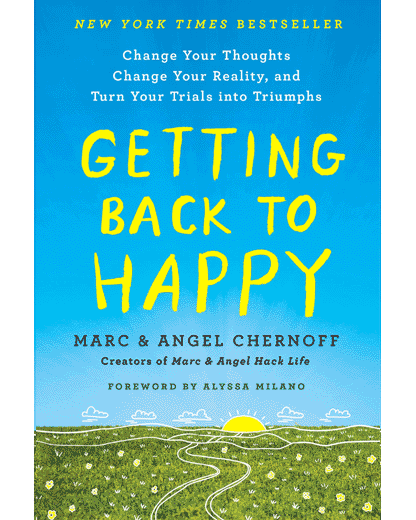 I purchased your book…Getting Back to Happy. Thank you Again. I’m trying! I’m truly a work in progress. Hello I am new to this site and the book. I am 57 single and my three girls are on their own with their lives. I find it so hard to get involved in trying to meet people to hang out with. So it has been depressing and I just need help. Just picked up your book at Barnes and Noble yesterday too. Loving it! I really like #9 – Love what you do until you do what you love. I think in an earlier post you had said that calmness is a super power — just do you thing with as much love and integrity as you can. I say this to myself on rough days. Whatever anyone else says to me are just words, so as long as I do my thing with love and integrity, everything else seems to be less bothersome. Also, instead of asking people to be blessed, I say — be a blessing. Because you reap what you sow. #7! I was thinking I need to be more active. I’ve retired and gotten very sedentary. I’m reading a lot but I’ve put on some extra pounds which are making it difficult to get moving. I read many of the points and they were good but number 7 made me get out of my recliner and go to the treadmill. I walked for 10 minutes! It was hard but I did it. I am vowing to do it everyday and add a minute everyday. Thank you for these points! Not tiptoeing around the subject but calling lazy LAZY! For saying you HAVE To do the hard stuff. I’m on my way. I have been having a very difficult year professionally. I changed companies and know this isn’t the long term place for me. I am consistently frustrated but more importantly I know because of this I’m not doing my best or working up to my personal standards. I love #9 “love where you are are until you can be where you love” such an amazing perspective that I know I need to embrace. Thank you!